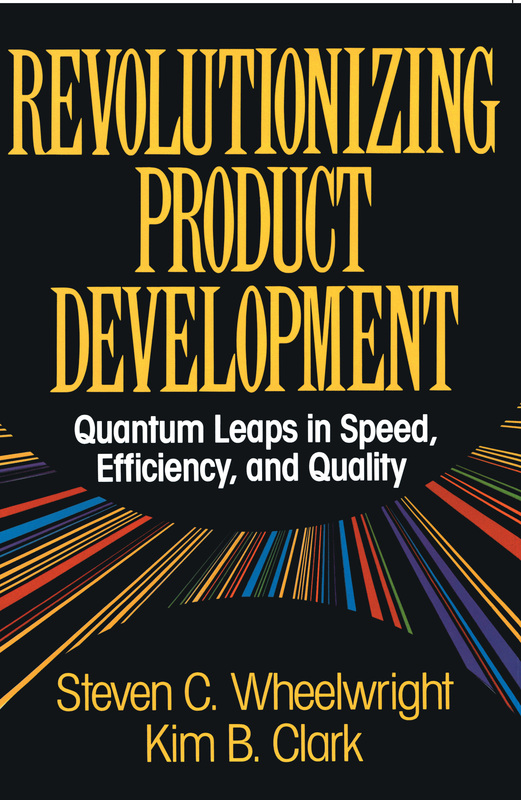 Today, a company's capability to conceive and design quality prototypes and bring a variety of superior products to market quicker than its competitors is increasingly the focal point of competition, contend leading product development experts Steven Wheelwright and Kim Clark. Drawing on six years of in-depth, systematic, worldwide research, they present proven principles for developing the critical capabilities for speed, efficiency, and quality that have worked again and again in scores of successful Japanese, American, and European fast-cycle firms. The authors argue that to survive, let alone succeed, today's companies must construct a new "platform" -- with new methodologies -- on which they can compete. Using their model for development strategies, Wheelwright and Clark show that firms can create a solid architecture for the integration of marketing, manufacturing, and design functions for problem solving and fast action -- particularly during the critical design-build-test cycles of prototype creation. They demonstrate further how successful firms such as Honda in automobiles, Compaq in personal computers, Applied Materials in semi-conductors, Sony in audio equipment, The Limited in apparel, and Hill-Rom in hospital beds have employed recent methodologies to bring new products to market at break-neck speed. Such innovations include design for manufacturability, quality function deployment, computer-aided design, and computer-aided engineering. Finally, Wheelwright and Clark emphasize the importance of learning in the organization. Companies that consistently "design it right the first time" and follow a path of continuous improvement in product and process development have a formidable edge in the crucial race to market. In a competitive environment that is global, intense, and dynamic, the development of new products and processes increasingly is a focal point of competition. Firms that get to market faster and more efficiently with products that are well matched to the needs and expectations of target customers create significant competitive leverage. Firms that are slow to market with products that match neither customer expectations nor the products of their rivals are destined to see their market position erode and financial performance falter. In a turbulent environment, doing product and process development well has become a requirement for being a player in the competitive game; doing development extraordinarily well has become a competitive advantage. * Intense international competition. In business after business, the number of competitors capable of competing at a world-class level has grown at the same time that those competitors have become more aggressive. As world trade has expanded and international markets have become more accessible, the list of one's toughest competitors now includes firms that may have grown up in very different environments in North America, Europe, and Asia. The effect has been to make competition more intense, demanding, and rigorous, creating a less forgiving environment. * Fragmented, demanding markets. Customers have grown more sophisticated and demanding. Previously unheard of levels of performance and reliability are today the expected standard. Increasing sophistication means that customers are more sensitive to nuances and differences in a product, and are attracted to products that provide solutions to their particular problems and needs. Yet they expect these solutions in easy-to-use forms. * Diverse and rapidly changing technologies. The growing breadth and depth of technological and scientific knowledge has created new options for meeting the needs of an increasingly diverse and demanding market. The development of novel technologies and a new understanding of existing technologies increases the variety of possible solutions available to engineers and marketers in their search for new products. Furthermore, the new solutions are not only diverse, but also potentially transforming. New technologies in areas such as materials, electronics, and biology have the capacity to change fundamentally the character of a business and the nature of competition. These forces are at work across a wide range of industries. They are central to competition in young, technically dynamic industries, but also affect mature industries where life cycles historically were relatively long, technologies mature, and demands stable. In the world auto industry, for example, the growing intensity of international competition, exploding product variety, and diversity in technology have created a turbulent environment. The number of world-scale competitors has grown from less than five in the early 1960s to more than twenty today. But perhaps more importantly, those twenty competitors come from very different environments and possess a level of capability far exceeding the standard prevailing twenty-five years ago. Much the same is true of customers. Levels of product quality once considered extraordinary are now a minimum requirement for doing business. As customers have grown more sophisticated and demanding, the variety of products has increased dramatically. In the mid 1960s, for example, the largest selling automobile in the United States was the Chevrolet Impala. The platform on which it was based sold approximately 1.5 million units per year. In 1991, the largest selling automobile in the United States was the Honda Accord, which sold about 400,000 units. Thus, in a market that is today larger than it was in 1965, the volume per model has dropped by a factor of four. Currently over 600 different automobile models are offered for sale on the U.S. market. Similarly, technological change has had dramatic consequences. In 1970, one basic engine-drive train technology (a V8 engine, longitudinally mounted, water cooled, carbureted, hooked up to a three-speed automatic transmission with rear wheel drive) accounted for close to 80 percent of all automobile production in the United States. Indeed, there were only five engine-drive train technologies in production. By the early 1980s that number had grown to thirty-three. The growing importance of electronics, new materials, and new design concepts in engines, transmissions, suspensions, and body technologies has accelerated the pace and diversity of technological change in the 1980s. Simply keeping up with those technologies is a challenge, but an often straightforward one in comparison with having to integrate them in development efforts. Similar forces have been at work in other traditional, mature industries. In textiles and apparel, for example, firms such as Benetton and The Limited have used information technology to create a production and distribution network which links retail outlets directly to distribution centers and back into factories and suppliers in the chain of production from fiber to finished product. The thrust of these networks is the ability to respond quickly to changing customer demands at relatively low cost. Fueled in part by availability and in part by growing demands for differentiated products, product variety has expanded significantly. In plant after plant, one finds vast increases in the number of styles produced and a sharp decline in the length of production runs. These are not changes of 10 or 20 percent; in the 1980s, it was common for apparel plants to experience a four- to fivefold increase in the number of styles produced. These increases in garment variety have pushed back into the textile plants as well. For example, the average lot size for dying at Greenwood Mills, a U.S. textile firm, declined in the 1980s from 120,000 to 11,000 yards. Changes in markets and technologies for automobile and textile firms have accentuated the importance of speed and variety in product development. But changes in competition, customer demand, and technology have also had dramatic effects on newer, less mature industries in which product innovation has always been an important part of competition. In industries such as computer disk drives and medical equipment, already short life cycles have shrunk further and product variety has increased. In addition, competition has placed increased pressure on product reliability and product cost. In disk drives, for example, the market for Winchester-technology hard disks has expanded from a base in high-end systems for mainframe computers to include a spectrum of applications ranging from notebook personal computers to large-scale supercomputers. Even within an application segment, the number of sizes, capacities, access times, and features has increased sharply. In addition to this explosion of variety, firms in the hard disk drive industry have had to meet demands for dramatic increases in reliability (tenfold in five years) and decreases in cost (5 percent to 8 percent quarterly). These have been met in part by incremental improvements in established technologies and in part through the introduction of new design concepts, production technologies, materials, and software. Much the same has been true in the market for new medical devices. Innovation has always been important in the creation of new medical devices, but by the 1980s success required the ability to follow an innovative product with sustained improvements in performance, application to new segments, improved reliability, and lower cost. In the case of devices for angioplasty (a procedure using a balloon on a small wire to expand clogged arteries), the initial innovation was followed by a variety of developments that offered the physician greater control of a smaller device, making access easier and creating additional applications. In concert with process changes that substantially improved or reduced variability of performance characteristics, changes in the product have opened up new applications and treatment of a more diverse set of clinical problems and patients, worldwide. Rigorous international competition, the explosion of market segments and niches, and accelerating technological change have created a set of competitive imperatives for the development of new products and processes in industries as diverse as medical instruments and automobiles, textiles, and high-end disk drives. Exhibit 1-1 identifies three of these imperatives -- speed, efficiency, and quality -- and suggests some of their implications. To succeed, firms must be responsive to changing customer demands and the moves of their competitors. This means that they must be fast. The ability to identify opportunities, mount the requisite development effort, and bring to market new products and processes quickly is critical to effective competition. But firms also must bring new products and processes to market efficiently. Because the number of new products and new process technologies has increased while model lives and life cycles have shrunk, firms must mount more development projects than has traditionally been the case utilizing substantially fewer resources per project. In the U.S. automobile market, for example, the growth of models and market segments over the last twenty-five years has meant that an auto firm must mount close to four times as many development projects simply to maintain its market share position. But smaller volumes per model and shorter design lives mean resource requirements must drop dramatically. Effective competition requires highly efficient engineering, design, and development activities. Being fast and efficient is essential but not enough. The products and processes that a firm introduces must also meet demands in the market for value, reliability, and distinctive performance. Demanding customers and capable competitors mean that the ante keeps going up -- requirements of performance, reliability, ease of use, and total value increase with each product introduction. When competition is intense firms must attract and satisfy customers in a very crowded market. More and more this means offering a product that is distinctive; that not only satisfies, but also surprises and delights a customer. Moreover, attention to the total product experience and thus to total product quality is critical. Firms that step up to the challenge and meet these competitive imperatives enjoy a significant advantage in the market place. The development of outstanding products not only opens new markets and attracts new customers, but also leverages existing assets and builds new capability in the organization. Getting a succession of distinctive new disk drives or a string of new medical devices to market quickly and consistently requires the solution of technical problems that builds know-how. Moreover, it stimulates the creation of greater capability in problem solving, prototype construction, and testing that can be applied in future projects. All of these skills and capabilities enhance a firm's ability to compete. But there is more. Successful new products also unleash a virtuous cycle in reputation and enthusiasm within and outside the organization. Inside, successful new products energize the organization; confidence, pride, and morale grow. The best employees remain challenged and enthused. Outside, outstanding new products create broad interest in the firm and its products, enhance the firm's ability to recruit new employees, and facilitate the building of relationships with other organizations. The organization's momentum builds and reinforces itself. While the potential opportunities to be realized in developing new products and processes are exciting, making them happen is a demanding challenge. New product or process development entails a complex set of activities that cuts across most functions in a business, as suggested by Exhibit 1-2, which lays out the phases of activity in a typical development project -- a new product. In the first two phases -- concept development and product planning -- information about market opportunities, competitive moves, technical possibilities, and production requirements must be combined to lay down the architecture of the new product. This includes its conceptual design, target market, desired level of performance, investment requirements, and financial impact. Before a new product development program is approved, firms also attempt to prove out the concept through small-scale testing, the construction of models, and, often, discussions with potential customers. Once approved, a new product project moves into detailed engineering. The primary activity in this phase of development is the design and construction of working prototypes and the development of tools and equipment to be used in commerical production. At the heart of detailed product and process engineering is the "design-build-test" cycle. Both products and processes are laid out in concept, captured in a working model (which may exist on a computer or in physical form), and then subjected to tests that simulate product use. If the model fails to deliver the desired performance characteristics, engineers search for design changes that will close the gap and the design-build-test cycle is repeated. The conclusion of the detailed engineering phase of development is marked by an engineering "release" or "sign off" that signifies that the final design meets requirements. At this time the firm typically moves development into a pilot manufacturing phase, during which the individual components, built and tested on production equipment, are assembled and tested as a system in the factory. During pilot production many units of the product are produced and the ability of the new or modified manufacturing process to execute at a commerical level is tested. At this stage all commercial tooling and equipment should be in place and all parts suppliers should be geared up and ready for volume production. This is the point in development at which the total system -- design, detailed engineering, tools and equipment, parts, assembly sequences, production supervisors, operators, and technicians -- comes together. The final phase of development is ramp-up. The process has been refined and debugged, but has yet to operate at a sustained level of high-yield, volume production. In ramp-up the firm starts commerical production at a relatively low level of volume; as the organization develops confidence in its (and its suppliers') abilities to execute production consistently and marketing's abilities to sell the product, the volume increases. At the conclusion of the ramp-up phase, the production system has achieved its target levels of volume, cost, and quality. In this phase, the firm produces units for commercial sale and, hopefully, brings the volume of production up to its targeted level. An obstacle to achieving rapid, efficient, high-quality development is the complexity and uncertainty that confronts engineers, marketers, and manufacturers. At a fundamental level the development process creates the future, and that future is often several years away. Consider, for example, the case of a new automobile. The very best companies in the world in 1990 could develop a new car in three to three and a half years. At the outset of a new car development program, therefore, designers, engineers, and marketers must conceive of a product that will attract customers three years into the future. But that product must also survive in the marketplace for at least another four to five years beyond that. Thus the challenge is to design and develop a product whose basic architecture will continue to be effective in the marketplace seven to eight years after it has been conceived. The problems that uncertainty creates -- e.g., different views on the appropriate course of action, new circumstances that change the validity of basic assumptions, and unforeseen problems -- are compounded by the complexity of the product and the production process. A product such as a small copier, for example, may have hundreds of parts that must work together with a high degree of precision. Other products, such as the handle of Gillette's Sensor razor, appear to be fairly simple devices but, because of very demanding performance requirements, are complex in design and come out of a manufacturing process involving sophisticated equipment and a large number of operations. Moreover, products may be evaluated across a number of criteria by potential customers. Thus the market itself may be relatively complex with a variety of customers who value different product attributes in different ways. This means that the firm typically draws on a number of people with a variety of specialized skills to achieve desired, yet hard to specify, levels of cost and functionality. To work effectively, these skills and perspectives must be integrated to form an effective whole. It is not enough to have a great idea, superior conceptual design, an excellent prototype facility, or capable tooling engineers; the whole product -- its design system, production process, and interaction with customers -- must be created, integrated, and made operational in the development process. But an individual development project is not an island unto itself. It interacts with other development projects and must fit with the operating organization to be effective. Projects may share critical components and use the same support groups (e.g., model shops, testing labs). Additionally, products may require compatability in design and function: models of computers use the same operating system, and different industrial control products conform to the same standards for safety. These interactions create another level of complexity in design and development. Critical links also exist with the operating organization. A new design requires the development of new tools and equipment and uses the skills and capability of operators and technicians in the manufacturing plant. Further, it must be sold by the sales group and serviced by the field organization. Of course, new products often require new skills and capabilities, but, whether relying on new or old, the success of the new product depends in part on how well it fits with the operating units and their chosen capabilities. Thus, effective development means designing and developing many elements that fit and work well as a total system. The uncertainty and complexity that characterizes the development of new products and processes means that managing any development effort is difficult; managing major development activities effectively is very difficult. Thus, while the promise of a new development project is often bright and exciting, the reality is often quite different. The following story, based on a composite of several situations we have encountered, illustrates typical problems in product development. In September 1989, Marta Sorensen, product manager for mid-range stereo systems at Northern Electronics Company, a large consumer electronics firm, laid out a plan for a new compact stereo system utilizing advanced technology and providing superior sound quality. Sorenson's marketing group at Northern felt that the company needed to respond quickly to the expected introduction of a new compact system by one of its toughest competitors. The plan Sorenson presented at the beginning of the concept investigation stage called for a development cycle time of one year, with volume production commencing in September 1990. (See Exhibit 1-3 for the initial schedule and subsequent changes.) This would give the factory time to fill distribution and retail channels for the all-important Christmas season in late 1990. As the exhibit suggests, the schedule began to slip almost immediately. Because of problems in freeing up resources and scheduling meetings, and disagreements about desired product features, the concept investigation stage was not completed until November 1989, six weeks later than originally planned. At that point, no change was made to the schedule for commerical introduction or start of pilot production, but two months were added to the prototype build and test schedule. This additional time was needed as a result of the selection of a new speaker technology that the engineering group had lobbied for during the concept development stage. It was assumed that the time originally allowed for pilot production could somehow be overlapped and/or compressed. By February 1990 new design problems had emerged. The compact size of the product created unexpected difficulties in fitting the components into a small space while maintaining sound quality. Furthermore, delays with a chip supplier and the speaker technology supplier set back the project schedule several weeks. A revised schedule, established in February 1990, called for completion of the design in April and completion of the prototype-build-test cycle by June. However, no changes were made to the schedule for pilot production or ramp-up. This meant a significant compression of the time between completion of prototype testing to commerical production; process engineering and manufacturing groups were asked to begin preparing the process for production even though the design was still incomplete. Design engineers worked hard to solve problems with product size, and cost and completed the design in May 1990. By that time, however, new problems had emerged with the prototypes and with the production process. Part of the delay in prototyping reflected late deliveries of parts from suppliers, overambitious testing schedules, and problems in scheduling meetings for milestone reviews. But part of the delay also reflected technical problems with the introduction of surface mount technology in the printed circuit boards for the product. Moreover, process engineering had experienced difficulties with production tooling. There had been a significant number of engineering changes to accommodate changes in exterior appearance as well as performance problems with the product. As a result, the completion of prototype testing was rescheduled for August and pilot production and ramp-up were scheduled to occur in rapid fire succession thereafter. Even the new schedule proved optimistic. As the fall months wore on and the project continued to slip, Sorenson and her marketing team realized that they would not meet the critical Christmas season deadline. Much of the latest delay had been caused by interaction between the product design and new automated assembly equipment that the manufacturing organization had installed. In order to meet product cost targets, manufacturing had chosen to move to an automated assembly system that would significantly reduce variable cost on the product. However, while design engineering was aware of the manufacturing plan, there were many subtle details of product design that conflicted with the capabilities of the automated equipment. These conflicts only surfaced late in 1990 as attempts were made to run full prototype units on the automated equipment. These problems required additional product redesign and slowed the completion of prototype testing. Engineers eventually corrected the problems and prototype testing was completed in February 1991. While compression of the schedule had made product and process engineering operate in parallel, the completion of prototype testing did not mark the end of design changes nor the alleviation of production problems in pilot production. Although Sorenson and the marketing group were happy to see the product make it through prototype testing, the fact that it was almost a year late had serious consequences for its potential attractiveness in the market. Sound quality and features were adequate and the cost and pricing were in line with expectations, but some of the product's aesthetics were out of synch with recent market developments. Thus, during the spring and summer of 1991 marketing pushed through a redesign of the product's exterior package to make it more attractive and contemporary. This caused some delays as engineering put through a crash program for new tooling and testing, but the redesigned exterior was put into production during the early fall. While the design of the new exterior was being developed, the manufacturing organization struggled to debug the new equipment and achieve consistent levels of quality. By September the plant had solved most of its major process problems and attention was shifted to increasing volume and filling channels for the 1991 Christmas season. Market acceptance of the new product was satisfactory, but did not meet the projections originally laid out in 1989. Further, the engineering and manufacturing organizations soon found themselves confronted by a large number of field-identified quality problems. Exhibit 1-4 documents the engineering change history of the product from the beginning of pilot production to its post-Christmas sales period. As the exhibit suggests, there was a flurry of engineering change activity shortly after the product went into commerical production and the manufacturing organization struggled to achieve target levels of yield and volume. Many of these engineering changes were intended to improve manufacturability. The significant peak in March 1992 reflected consumer experience with the product following the Christmas season. In February and March of 1992 design engineering launched a crash program to solve several field problems with product reliability. The experience of Northern Electronics with the Al4 stereo system is not a pathological example. It reflects experience that is all too common in the world of product and process development. The failure of the Al4 project to meet its original potential and expectations was not due to a lack of creative people, management desire, technical skills, or market understanding. The company had excellent marketing information, good relationships with its dealers and customers, recognized competence in engineering and design, and was known for its technical expertise. The A14's problems were rooted far more in the inability of the organization to bring together its insight and understanding and the expertise of its people in a coherent and effective way. In short, the Al4 had problems because Northern lacked critical capabilities for integration. Column 1 of Exhibit 1-5 summarizes typical characteristics of problematic projects like the A14, and column 2 identifies some of their implications. Problems on the A14 were rooted in the nature of the development process and its organization and the absence of a coherent and shared cross-functional plan for competing in the compact stereo market. Different functional groups (e.g., marketing and engineering) had different agendas and there was no organizational process to resolve issues before they surfaced throughout the phases of the A14 development effort. This led to delays and miscommunications throughout. The development process itself contributed to delay and poor design. The many late engineering changes reflected in part a poorly organized and executed prototyping process. Some prototype parts came from suppliers unfamiliar with the commerical production environment at Northern and were late and poorly built. Delays getting into manufacturing were caused by a narrow focus on product performance in design choices (no design for manufacturability) and barriers to communications between engineering and manufacturing. Management treated the development of new products as the responsibility of the engineering group. Manufacturing was not of primary concern, at least not until problems with the new automated process began to surface. Without strong leadership, problems in the project went undiscovered, surfaced late, and were difficult to resolve. In contrast to the A14 experience, column 3 in Exhibit 1-5 lays out selected themes in an outstanding development project. Objectives and accountability are clear and widely shared and stem from a concept development and product planning process that brings marketing, engineering, and manufacturing together. Moreover, early-stage development builds on clear strategies in the organization for the product line and major functions. In effect, the outstanding organization starts development projects with concept development on a firm foundation. Once the concept has been developed and plans for the product have been laid out, execution in outstanding programs has a distinctive character. Guided by strong leadership, engineers with broad skills work in a coherent team with skilled people from marketing and manufacturing. "Integrated" describes day-to-day problem solving across departments and functional groups fight down at the working level. Strong, collaborative relationships across departments are rooted in intensive communication, a shared responsibility for product performance, and an appreciation of the value to be added by each group. In this context an excellent engineering design is one that not only achieves outstanding performance but also is manufacturable and comes to market rapidly. Indeed, time-to-market is such a critical dimension of performance in the outstanding project that all of the processes, systems, and activities in development are geared to fast action. This is particularly true for the critical design-build-test cycles that are at the heart of problem solving in development. Thus, the outstanding project has a prototyping process that creates representative components, subassemblies, and complete units of high quality. These prototypes in turn come out of a design process in which careful and simultaneous attention to the details and behavior of the product as a system catches numerous problems and identifies important opportunities early in the process. In this setup, engineers concentrate on eliminating redesigns caused by mistakes, poor communication, and lack of process understanding, and maximizing product performance and distinctiveness for its target market. "Design it fight the first time" is critical because it creates products of high quality and saves valuable time. Outstanding projects of this kind are not possible without leadership. In contrast to problematic projects where direction is lacking and responsibility diffuse, the excellent project has a project leader who gives conceptual direction and stimulates and nurtures working-level integration. Moreover, that leadership extends to linkages with critical suppliers, customers, and the market. The outstanding project leader fosters internal integration and integrates customer needs into the details of design. Effective product development is not the result of a single individual, but strong leadership makes a difference. The themes that characterize outstanding development projects -- clarity of objectives, focus on time to market, integration inside and out, high-quality prototypes, and strong leadership, to name a few -- reflect capabilities that lead to rapid, efficient development of attractive products and manufacturing processes. The power of such capabilities lies in the competitive leverage they provide. A firm that develops high-quality products rapidly has several competitive options it may pursue. It may start a new product development project at the same time as the competitors, but introduce the product to the market much sooner. Alternatively, it may delay the beginning of a new development project in order to acquire better information about market developments, customer requirements, or critical technologies, introducing its product at the same time as its competitors but bringing to market a product much better suited to the needs of its customers. Furthermore, if it also has achieved speed and quality in an efficient way, it may use its resources to develop additional focused products that more closely meet the demands of specific customer niches and segments. Whatever the mix of customer targeting, speed to market, and product breadth the firm chooses to pursue, its advantages in fundamental capabilities give it a competitive edge. For a firm like Northern -- with slipping development schedules, late design changes, and problems with field failures -- competing against a firm capable of rapid but effective product development can be a bewildering, discouraging, and ultimately unprofitable experience. Exhibit 1-6A illustrates just such an episode in Northern's history. Consider first Panel A, which graphs the price, cost, and product generation experience of Northern and its principal competitor, Southern Electronics Company, from 1978 until 1985. Until 1985, both Northern and Southern followed standard industry cycles in new product development, pricing, and manufacturing costs. With a product development cycle of eighteen to twenty months, both firms introduced new generations of product every two years. Between major generational changes in products there were frequent model upgrades and price declines as the cost of key components and manufacturing fell with increasing volume. Thus, until the mid 1980s, both Southern and Northern had prices and costs that tracked each other closely, and both mirrored industry averages. In the early 1980s, changes in Southern laid the foundation for a significant change in the nature of competition in the industry. Stimulated by the efforts of Greg Jones, the new vice president of engineering, Southern embarked on a concerted effort to reduce its product development lead time. Without compromising quality, Jones and the entire organization began to develop the characteristics sketched out in column 3 of Exhibit 1-5. Stronger leadership, more effective cross-functional integration, greater attention to issues of manufacturability and design, more effective prototyping, and a revamped, development process gradually led to a reduction in development lead time from eighteen to twelve months. By 1986 Southern could develop a comparable compact stereo system about six months faster than Northern. As Panel B of Exhibit 1-6B suggests, Southern began to use its new development capability in early 1986. At that point it broke with industry tradition and introduced its next generation of stereo product about six months sooner than expected. With a more advanced system and superior performance, Southern was able to achieve a premium price in the marketplace. Although Northern followed six months later on a standard cycle, its next generation stereo was unable to command its traditional market share. As a result, Northern's volume increased more slowly than expected and its cost position began to erode slightly relative to Southern. Southern Electronics introduced its next generation product eighteen months later in the fall of 1987. Once again the product achieved a premium price in the market. However, Southern did not fully exploit its premium pricing opportunity. Instead, it lowered prices somewhat to increase further its market share. At that point, not only was Northern behind in product features and technology, but Southern's aggressive pricing posture put even more pressure on Northern's sales volume and margins. Although Northern fought back with price discounts, increased advertising, and promotions to dealers, it was unable to stem the erosion of its historical market position. The result was an even greater disparity in the cost positions of Northern and Southern Electronics. In late 1988, Northern introduced its next generation stereo system, the A12. Developed under the motto "beat Southern," Northern's executives felt that the A12 would be the product to regain their former competitive position in the market. Much to their surprise, however, the rollout of the A12 in early 1989 was met by Southern's introduction of its next generation stereo system: Southern had moved to a twelve-month product introduction cycle in late 1988. At that point Northern was a full generation of technology behind Southern in its market offerings. Northern's management determined that the only course of action open was to accelerate development of the next generation system, the A13. They thus embarked on a crash development effort to bring the A13 to market in early 1990. At the same time Sorenson and her colleagues began development on the A14, which they targeted for the Christmas 1990 selling season. The A14 was to get them back into the competitive ball game on solid footing -- a "close the gap" strategy. While Northern's strategic intent was to catch up to Southern with accelerated product development, the reality was much different. Northern brought the A13 to market in early 1990; but the development process was so hectic and the ramp-up in manufacturing so strained that the company effectively lost control of its costs. The product came to market but was much more expensive and less effective than the company had planned. Because of its many problems, scarce development resources that were to have been moved to the A14 in early 1990 were focused instead on correcting problems and cleaning up the A13's design. To make matters worse, Southern continued to follow its twelvemonth introduction cycle and actually beat Northern to the market with its next generation product. The result for Northern was a further erosion in margins and market position. Without making fundamental changes in its development process, which management considered neither necessary nor within the charter of Sorenson and those working on the A14, Northern's attempt to push ahead with the A14 for the 1990 Christmas season was a dismal failure. The A14 product had so many problems in the field and was so expensive to manufacture that the product line became a serious financial drain on the company. The key to Southern's success in the compact stereo market was its consistent ability to bring excellent products to market before its competitors. This ability was rooted in fundamental changes that Jones and others had made in its development process. These included obtaining broad-based organizational and individual buy-in to key project goals, at the onset, and empowering and encouraging development teams to modify the development process while developing the needed products. In addition it harnessed that capability to a marketing and pricing strategy that was well targeted at Northern's weaknesses. In effect, Southern changed the nature of competition in the industry; Northern was forced to play a game for which it was ill suited -- a game Northern never fully comprehended until it was years behind in capability. * Quality of design. Because Southern had a twelve-month development cycle, it could begin the development of a new product closer to the market introduction date than its competitors. Whereas Northern had to begin eighteen to twenty months before market introduction, Southern's designers and marketers could gather and refine an additional six months of information before setting out to design a new product. In a turbulent environment, designers face a high degree of uncertainty in the early stages of development about which set of product characteristics will be most attractive to target customers. Additional time to secure feedback on the most recently introduced generation and to learn about market developments and emerging customer preferences may mean the difference between winning and mediocre products. Although the product may use the same basic technologies, additional market information may yield a much better configuration. The product's features and aesthetics may be fresher, more up-to-date, and more closely matched to customer expectations. Thus, Southern could exploit its lead time advantage by waiting to launch its development effort until more and better market information became available. Even though its product would arrive on the market at the same time as its competitors, its product would offer the customer a superior experience. * Product performance. A much faster development cycle gave Southern Electronics the opportunity to launch a new product program well in advance of its competitors. It could use that lead to introduce the next generation of product technology. In this case, the advantage of speed lay not in superior market or customer intelligence, but rather in the ability to exploit technological developments and bring them to market faster than its competitors. The gap in performance this created is depicted in Exhibit 1-7 for a single product generation. As illustrated in the exhibit, a six-month jump on competitors in a market accustomed to eighteen- to twenty-four-month design lives can translate into as much as three times the profit over the market life of the design. Conversely, being late to market with a new product can lead to break-even results and zero profit. This provided Southern with the leverage to control not only their own profits and returns, but also those of their chief competitor, Northern. Putting a sequence of such developments together further widens the competitive gap, as depicted in Exhibit 1-8. The slow-cycle competitor brings new technology to market every two years. The fast-cycle competitor, in contrast, achieves the same performance improvement every twelve months. While the initial advantage of the fast-cycle competitor is relatively small, the ability to move quickly to market eventually creates a significant performance gap. To the extent that customers can discern the difference in performance and to the extent that the gap offers them valuable improvements, a faster time to market creates a superior product. * Market share and cost. A better product design and superior product performance gave Southern the opportunity to achieve premium prices in the market. However, a firm may also choose to price its product to create superior value for its customers, thereby translating advantage in design and performance into increases in market share. Where lower costs are driven by growth and increases in volume, increases in market share may translate into improved cost position for the fast-cycle operator. Thus, even if two competitors operate on the same learning curve, the fast-cycle competitor will achieve a cost advantage. However, it may also be the case that the capabilities which underlie fast development cycles create a steeper learning curve. Speed in development is rooted in the ability to solve problems quickly and to integrate insight and understanding from engineering with critical pieces of knowledge in manufacturing. This set of capabilities likewise is critical in achieving cost reductions in established products. Thus, when costs are sensitive to volume and fast-cycle capability enhances a firm's overall learning capacity, the fast-cycle competitor enjoys double leverage in improving its manufacturing costs. How a fast-cycle competitor chooses to exploit the potential advantages in design, product performance, and manufacturing cost will depend on the competitive environment and the firm's strategy. In the case of Southern Electronics, all three dimensions of advantage were important. Initially, Southern used its six-month advantage in lead time to obtain better market information and still introduced its 1986 compact stereo about six months before its competition. In the second generation, however, Southern accelerated its model introduction and began to exploit its development capacity to achieve superior product performance. By 1990, Southern was a generation ahead of its competitors in product technology. It used its superior design and performance to achieve some price premium in the market, but it did not raise prices as much as its performance advantage warranted. The result was a superior value for customers, increases in market share, and steeper slopes on its manufacturing learning curve. Thus, Southern used its advantage in performance and cost both to expand its market share and increase its margins. But perhaps the most powerful effect of Southern's fast-cycle capability was its ability to change the nature of competition. By improving its development productivity and shortening the time between product generations, Southern forced Northern to play a competitive game that Northern was not prepared to play. Northern would have faced competitive difficulties no matter how it responded to the Southern challenge, but it compounded its problems by failing to change fundamentally its approach to product development. By attempting accelerated development in the context of its traditional systems, Northern created internal confusion, strained its resources, and actually reduced the effectiveness of its development organization. In addition, previously enthusiastic, capable, and hard-working product managers such as Sorenson became frustrated and disappointed. Thus, at the start of the 1990s, Northern Electronics faced the challenge of undertaking a major overhaul of its development process while its margins were eroding, market position was slipping, and morale among some of its best development people was declining. Southern's fast-cycle capability had clearly put Northern and its other major competitors at a significant competitive disadvantage while generating additional enthusiasm and competence among people such as Jones and individual project contributors. Southern was continuing to build momentum as Northern and other competitors continued to lose it. Achieving competitive advantage through effective development capability is not just a theory. Effective fast-cycle competitors have emerged in a wide range of industries. Firms such as Honda in automobiles, Applied Materials in semiconductor production equipment, ACS in angioplasty, Sony in audio products, Matsushita in VCRs, The Limited in apparel, Philips in computer monitors, Hill-Rom in hospital beds, and Quantum in disk drives have made the ability to bring outstanding products to market rapidly a central feature of their competitive strategy. Once achieved, and subsequently maintained as the organization grows, an advantage built around fast-cycle capability seems to be strong and enduring. In the first place, the advantage is based on capabilities -- human and organizational skills, processes and systems, and know-how -- that are difficult to copy. Moreover, effective, rapid development creates superior products and offers customers superior value. It therefore helps to create a market franchise and brand equity. A real product advantage rooted in difficult-to-copy capabilities and a translation of that product advantage into a fundamental market franchise that reinforces its own momentum is a powerful combination. Although product development is difficult, doing it well confers significant advantage. Furthermore, the more challenging the development requirements, the more dramatic the potential impact. In this book we lay out concepts for the effective organization and management of product and process development. Each chapter frames a particular problem or issue in development, provides a set of ideas for effective management, and illustrates those ideas and their application with several examples. The cases accompanying each chapter in the College version provide an opportunity to apply and develop the concepts and ideas in a practical context. The first part of the book focuses on the front end of the development process. In Chapters 2 through 5 we discuss the concept of development strategy, the use of maps and mapping to chart an organization's path through the development terrain, the creation of an aggregate project plan to guide a portfolio of development efforts, and the challenge of creating an overall development process that effectively initiates and selects projects and focuses the organization's resources to bring the most attractive projects to market rapidly and efficiently. The thrust of these chapters is laying the foundation for effective development efforts. While the actual development project is a natural locus of attention and effort in organizations, individually effective development projects depend on a strong foundation in strategy, a shared understanding across functional organizations, and an overall process that effectively allocates and concentrates time, energy, attention, and resources on the most attractive opportunities. Chapters 6 through 10 focus on the management of individual development projects. We first work through an overall framework for evaluating development efforts, including identification of the important phases of development, the measurement of performance, and the critical areas of leverage and choice for managing projects. We then examine the problems of cross-functional integration. A central theme in this part of the book is the power of integrated problem solving. Chapter 8 deals with the problem of organizing development projects. Our emphasis is on the organizational structure, the processes the organization uses to carry out development, and the impact of development leadership. We lay out four contrasting approaches to development project organization and focus particular attention on what we call heavyweight project teams. The challenge of integration applies not only to large functional organizations like marketing, manufacturing, and engineering, but also at the working level within those organizations and across departments and work groups with different disciplines, tasks, and experiences. Chapter 9 focuses on recent developments in systematic methods and tools for product (and process) development. Concepts such as quality function deployment, design for manufacturability, computer-aided design, and computer-aided engineering represent new design and development methodologies. Much of the thrust of these methodologies is the creation of more effective integration in the development process. In Chapter 10 we examine prototyping, testing, and convergence to a final design. Much of development is a sequence of design-build-test cycles in which prototyping and testing play a central role. Effective management of prototyping is therefore a critical element of effective development capability. In the final chapters of the book, we shift our attention from the planning and execution of specific projects to the problem of managing the improvement of the development organization and its processes. In Chapter 11 we examine the problem of learning from individual development experiences. This involves not only capturing the insight and understanding that come from current experience, but also capturing that experience in the form of changes in the development process. In addition, learning from experience involves building resources and capabilities to conduct development efforts more effectively in the future. Thus the major focus of Chapter 11 is on mastery of the building blocks for superior development capability and the associated investment in people, skills, tools, and systems. The book concludes with a chapter on making it happen. We examine alternative improvement paths and focus on the peculiar nature of the development process and consequent issues that managers must examine in pursuing an overall improvement plan. A central theme in this final chapter -- and, indeed, throughout the entire book -- is the importance of learning by achieving consistency and balance across a wide range of development activities. There are no "three easy steps" to effective development performance. The capabilities that allow an organization to move quickly and efficiently to the market are rooted in people and their skills, organizational structure and procedures, strategies and tactics, tools and methodologies, and managerial processes. This is what makes it so difficult for organizations to improve -- and why they acquire such a strong competitive advantage when they do.